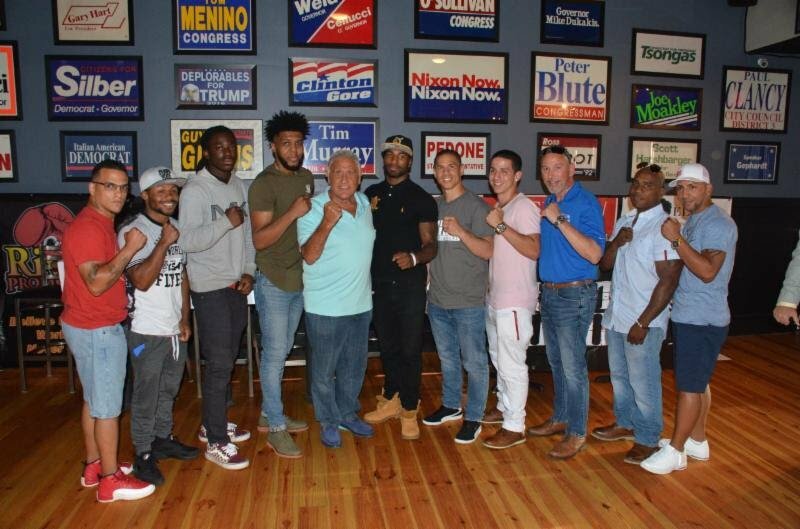 Granite Chin Promotions (GCP) and Rivera Promotions Entertainment (RPE) hosted a press conference yesterday at The Ballot Box in Worcester, Massachusetts, to make a major announcement, as well as introduce local fighters on the August 17th pro boxing card at The Palladium in Worcester. Three-time, two-division world champion “El Gallo” Jose Antonio Rivera (41-6-1, 24 KOs) is making his return in the “Making History” main event, in large part because he wanted to fight on the same card as his son, A.J. Rivera, who was to become the first pro boxer who was born with Spina Bifida. A.J., who is a rising matchmaker in New England, was unable to get medically cleared in time and he will not be fighting Aug. 17. The event has been renamed, “Homecoming”, because six of the competing fighters, including Jose Antonio Rivera, live in Worcester. Now 45 years old, Rivera has already lost more than 30 pounds, and he is within eight of his contracted weight for his eight-round fight against Ruben “Modern Day Warrior” Galvan (27-26-4, 10 KOs). In 1997, Rivera captured the International Boxing Organization (IBO) World welterweight title, stopping Gilberto Flores in the second round. Six years later, he traveled to Germany to take on undefeated, hometown favorite Michel Trabant (38-0) for the vacant World Boxing Association (WBA) World Welterweight Championship, in which Rivera won a 12-round decision and the belt. Two fights later, in front of nearly 10,000 hometown fans in Worcester, Rivera won a 12-round unanimous decision in 2006 over defending champion Alejandro Garcia (25-1) for the WBA World super welterweight title. Middleweight Kendrick Ball, Jr. (9-1-2, 6 KOs) and junior middleweight Khiary Gray (15-4, 11 KOs), both promoted by CES Boxing, will be making their pro debuts at home in Worcester. Ball faces an opponent to be determined in the six-round co-featured event, while Gray (15-4, 11 KOs) meets Antonio Chaves Fernandez (9-33, 4 KOs), of Brockton, MA, also in a six rounder. Undefeated light heavyweight prospect Richard “Popeye The Sailor Man” Rivera (8-0, 7 KOs), fighting out of Hartford, CT, is slated to fight in a six-round bout vs. TBA, as well as his stable mate, two-time New England Golden Gloves champion “The Chosen One” Sharad Collier (1-0, 1 KO), who takes on his Mexican opponent, Emmanuel “Pollo” Valadez (5-4, 4 KOs), in a four-round match. Also scheduled to fight on the undercard in four-round bouts are Springfield, MA welterweight Jose Angel “KO” Ortiz Jose Angel “KO” Ortiz (4-13-1, 1 KO) vs. Seth Basler (0-8) and pro-debuting featherweight Joshua Orta vs. Worcester’s Edwin Rosado (1-7-1, 1 KO), Southbridge, MA welterweight Wilfredo “El Sucaro” Pagan (4-0, 2 KOs) vs. TBA, Worcester lightweight Francisco Irizarry (4-0, 2 KOs) vs. TBA, Worcester’s pro-debuting lightweight Eslih Owusu.vs. Mexican Engelberto “Guarura” Valenzuela (11-14 (3 KOs). Event sponsors include Lundgren Honda, Elm Wealth Group, Atty. Maria M. Rivera-Cotto, Championsofhealth@USANA.com, Chieftain Liquors, Centro Las America, Baystate Savings Bank, Pamela Laporte Realty, Worcester Vocero, ChrisFIT Xperience and Grille 57 (hosting the official weigh in and after party). A portion of the proceeds will go to Spina Bifida Association of Greater New England. “Four Worcester fighters (Ball, Gray, Irizarry and Owusu) on this card have never fought here. It’s huge having Kendrick and Khiary on this card and I’d like to thank CES Boxing for allowing them to fight here. I’m proud of Kendrick and Khiary and excited to have them fighting on this show. Chuck and Granite Chin are running this show, I’m only focused on my opponent. Jimmy Burchfield (CES promoter): “What’s important is that Jose Antonio Rivera is fighting on this card and that’s why I’m allowing ‘Pepper’ (Ball) and Khiary to fight on this card. I’ve had a good relationship with Chuck and I’ve known Jose and A.J., who worked for me, for a long time. Nothing was happening in Worcester boxing for years, until Jose and A.J. started promoting here, but Worcester has always been a good fight town. All the fighters here will be proud of your victory. This is beautiful! They’ve been around him and know what he’s accomplished in life. Jose has never abused his body, he’s taken good care of himself.